After exhaustive research, we’ve come up with a tongue-in-cheek selection of situations, places, dishes and traditions that only those that live on the island will truly understand. Ready to discover if you are a true native of Ibiza? 1.When you started going out as a teenager you used to meet your friends under the clock on the Vara de Rey promenade. 1.You can’t go for more than 2 months without eating one of the delicious sandwiches served at Bar Costa in Santa Gertrudis. 3.You’ve celebrated New Year’s Eve at Pachá, whilst all the tourists were convinced it was closed in winter. 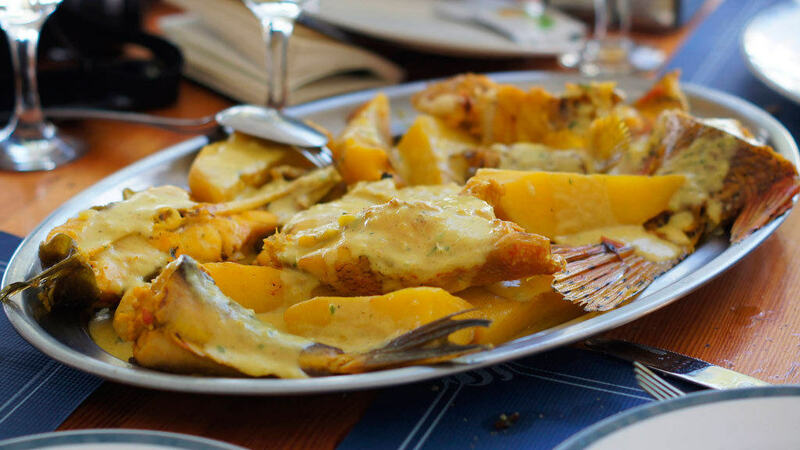 4.If it’s Sunday, then the delicious bullit de peix fish dish is on the menu. 5.When any car journey longer than 20 minutes feels more like 2 hours. 6.You’ve tasted the paella at El Carmen restaurant in Cala d’Hort. 7.In summer you prefer to hit the beach first thing in the morning or later in the evening to avoid the crowds. 8.Going out for a drink meant (or means) heading for Ibiza’s Los Pasajes waterfront area. 9.Flaó cheesecake and Greixonera milk pudding are your two favourite desserts. 10.You’ve strolled among the almond blossom in Santa Inés. 11.You’ve seen more sunsets on the beach than anyone. 12.You’ve experienced the magic of Es Vedrà over a hundred times. 13.You love the island’s inland areas as much or even more than you do the coast, and know that they are less crowded in summer. 14.You’ve dressed up to take part in the Pujada a Sa Catedral race that takes place on 31st December. 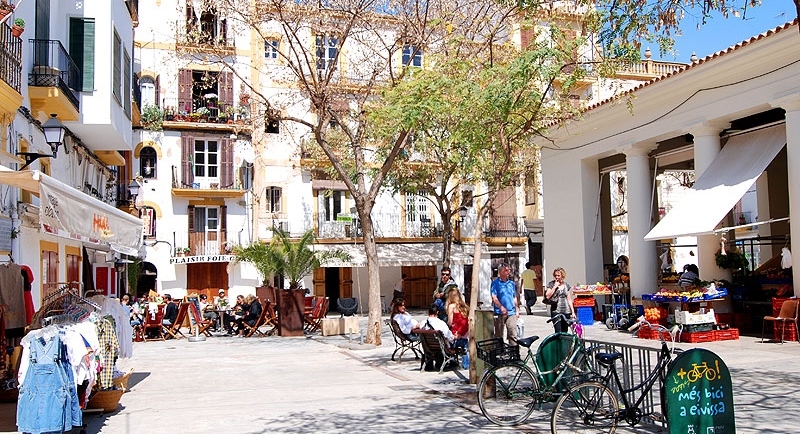 15.‘El Medieval’ is your favourite street market and festival held in the ‘Dalt Vila’. 16.You always take anyone who comes to stay with you to visit a Hippy Market. 17.You’ve taken part in the Pujada a Sa Cala rally and the Cursa de s’Indiot cycle race. 18.All you need to disconnect and unwind is a 30 minute boat trip to Formentera. 19.The conservation of Neptune sea grass is something you are truly passionate about. 20.You’ve eaten more than one tuna and olive filled baguette at the Mercat Vell. 21.‘Vila’ is your name for Ibiza Town centre. 22.If you’re planning a trip to Formentera, you arrange it at least a month in advance. No matter that it’s just an hour’s boat trip away. 23.You understand and even use, when appropriate, words such as mursiano, guiri and peluts. 24.You jog, skate or ride your bike along the Botafoch promenade. 25.You give it all you’ve got, right down to the last gasp, at the Full Moon raves in the caves at Cala Compta. 26.You’ve gone wild on a shopping spree at Las Dalias street market when accompanying a first-time visitor. 27.A (non-Ibizan) friend asks you to find them somewhere to stay for five days in the middle of August. And you think to yourself: there’s not a bed to spare on the island! You suggest they try Toledo. 28.You think it’s absolutely crazy that in summer it is impossible to find a square foot of free sand to bask in the sunshine. 29.You only visit towns you haven’t been to for years, like San Mateo and Santa Inés, when visitors come to stay and you start feeling like a tourist too. 30.You can’t miss a visit to Es Pla des Corona to admire the almond trees in blossom. 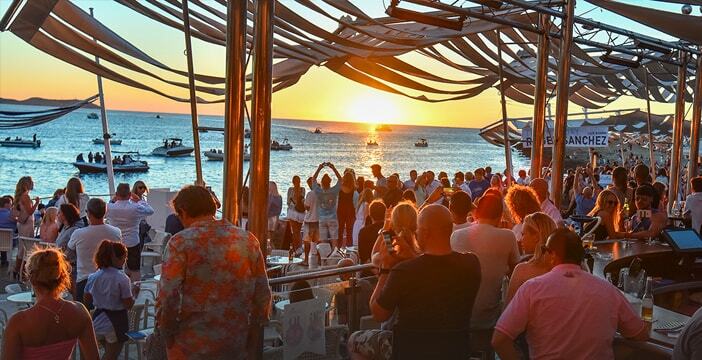 31.You’ve relaxed over a few beers whilst listening to chill out music at the Café del Mar. 32.You’ve dressed up as a hippy for a flower power themed party and danced to “Love is in the Air”. 33.You too have been to one of the thousands of white parties held on the island over the summer season. 34.You’ve made a wish in exchange for an offering to the goddess Tanit. 35.You’ve left home whilst it’s still light – and come home in the light too. 36.You’ve been to Atlantis to admire one of the island’s most breathtaking spots. 37.No family Sunday lunch is complete without a shot of Ibiza’s herb liqueur or Frígola. 38.You NEVER, EVER drink tap water. Especially if you live in Sant Jordi, where you even use bottled water to clean your teeth. 39.The probability of meeting someone from Ibiza whose grandparents all came from Ibiza is practically zero. 40.You are convinced that the classic all i oli garlic mayonnaise made by hand using a pestle and mortar at the Pou Des Lleó Restaurant is the best in the world. 41.In summer your home is transformed into a guest house with a constant flow of visitors. 42.You hate the image people from outside Ibiza have of the island. You never tire of explaining that luckily there is “another Ibiza” and that it’s not all about partying. 43.You’re also tired of explaining to friends and relatives living on mainland Spain that you don’t spend every evening at Amnesia or Privilege. And that you most certainly don’t go to the beach every morning. 44.You love rummaging for vintage bargains at the Sant Jordi street market. 45.You jump over the bonfires to celebrate the summer solstice on the eve of Saint John’s Feast Day. 46.By the time September comes, you’re as eager for the season to finish as you were for the island to start livening up in April. 47.Chaos reigns on the island whenever it rains. 48.You know the names of the world’s top DJs even though you’re not a fan of electronic music. 49.You’re convinced that nothing can beat a mojito made by the Brazilian on Cala Saladeta beach. 50.You’ve watched the sun go down with a mojito in your hand at Kumharas. 51.Wherever you travel, even if it’s to the Caribbean, you always end up saying “You can’t beat Ibiza for beaches”. 52.You are convinced that the sunset in Cala d’Hort is the most spectacular view on Earth. 53.Your skill at dodging nightclub promoters is on a par with that of Cristiano Ronaldo. 54.You were truly shocked when the Serra cinema closed. 55.You will never tire of explaining to ‘strangers’ and tourists the difference between “algae and sea grass”. 56.You’ve eaten fried fish at the ‘secret’ beach bar in Sa Punta. Its real name remains a mystery. 57.You lose your cool when you have to drive round and round for ages to find a parking space in the centre of Ibiza in summer. 58.You season your dishes with salt from Ibiza’s salt flats. 59.You know some of the traditional songs your grandparents used to sing to you. 60.You know how to dance the ‘ball pagès’ or enjoy watching other people doing it. 61.You are of the opinion that enjoying a delicious rice dish overlooking the sea in Es Torrent is one of life’s greatest pleasures. 62.You get summer off to the best possible start at the ‘opening parties’ and see out the season with the ‘closing parties’. 63.You’ve had your photograph taken at Portinatx lighthouse. 64.You’ve visited the Can Marça caves. 65.You never fail to be impressed by the fabulous yachts moored in Ibiza marina. 66.You go out in the evening in your flip-flops, with your swimsuit underneath your party gear, just in case. 67.You keep a summer survival kit in the boot of your car: towels, flip-flops, a sun umbrella and cool bag for your picnic. 68.You dance to the rhythm of the drums in Benirrás. 69.You’ve immortalised the early evening light from Ses Salines Nature Park. 70.You love the views of the island from its highest point at Sa Talaia. 71.You feel like a foreigner when you head to the West End in San Antonio for a night out. 72.You use expressions like “quin delibat” (what a fuss), “donar una clecla” (to slap) and “anar de palanca” (go on the pull). 73.No matter how cold it is, you never miss the celebrations that mark the Feast Day of Sant Antoni de Portmany. The music of the ‘Flower Power’ and ‘La Movida’ festivals will transport you back to the sounds of the 70s and 80s. Post your comment if you think we’ve forgotten something important about the people of Ibiza. We will be delighted to learn more about the culture and people of an island that contributes so much to THB hotels.